If real, authentic relationships are important to the success of your business, it’s invaluable to know exactly who you can build relationships with. They are someone you want to have a relationship with. They are open to starting a new relationship. You are able to build rapport with them. 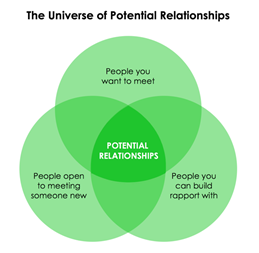 Each of those three criteria can be represented by a circle, and the universe of potential relationships exists where all three circles overlap (when people fit all three criteria). In two recent articles, I explored items 1 and 2 from the list above. Now, let’s take a look at the final piece of the puzzle: people you can build rapport with. Building rapport with another person starts with understanding how relationships are formed. It’s a simple misperception that in order to build a relationship, you need to get the person to like you. The belief is that relationships are formed just by Person A and Person B liking each other. But that’s not how it actually works. Relationships are actually formed (and deepened) when both Person A and Person B like the same things. Both like Thai food? Check. Similar sense of humor? Done. Golf fanatics? Great! Those things that both people share are called commonalities and they are the secret to building and deepening relationships. Here is a quick exercise: make a list of a few people that you have great relationships with. Then, make a list of all the things you have in common; things you both like, whether you’re both introverted or outgoing, similar experiences you’ve had in life (even if they weren’t things you did together), your opinions on politics and the world, what you do to relax, and so on. When we do this with clients at Civilis Marketing, they are often surprised at how long this list can become. They can quickly come up with twenty, thirty or even fifty commonalities they share with their best relationships! Next, write down a couple of people you wish you had a better relationship with and make a list of things you have in common. Like our clients, you’ll probably find that the list is much shorter—maybe only two or three things total. The question, then, is are you just out of luck when it comes to those people? The good news is that you’re not out of luck—you just need to get more creative in finding commonalities with those people. Characteristics – What and who you are. Title/responsibilities, industry certifications, ages/genders, ethnicities, group memberships, physical traits, and family situations are examples of potential shared characteristics. Behaviors – What you do and how you do it. Being very organized or disorganized, following the rules or breaking them, being boisterous or quiet. People who have similar behaviors are more likely to form a relationship than those who don’t. Experiences – Where you’ve been and what you’ve done in the past (or what you are going through right now). Travel experiences, raising kids, working at a certain company or job, living in a particular place, or going through some sort of life event are examples of potential shared experiences. Interests – What you enjoy. The list of potential shared interests is long: hobbies, sports teams, movies, music, food, vacation destinations, particular authors, business gurus, sunny weather … the list goes on and on. Interests provide the widest variety of potential commonalities. Opinions – What you think and how you see the world. Political views, religious affiliation, commentary on current events, and business industry views fall into this category. Opinions are the most volatile of all commonality types. They can forge incredibly strong bonds between people, but they can also alienate people who don’t share your opinions. So, great care must be taken to ensure that your opinion is one that the would-be relationship agrees with before exploring it as a potential commonality. Even with all five of these types, there are still times when we find our clients have trouble identifying enough commonalities with their important (or desired) relationships. That’s when it helps to take a different perspective on things that might not initially seem like they are commonalities. Let’s say I like running and you like golf. On the surface, there is no commonality there. But wait a minute, running and golf are both outdoor activities, so we both love being outside. And, I can guarantee you that if we are stuck in the office on the first warm day of spring, we’re both yearning to be outside enjoying the weather. So, while we don’t like the same sport, we do love the same weather. When you go deeper on items that don’t appear to be commonalities (or just look at them from a different angle), you can almost always find aspects of them that are shared between two people. When we work with Civilis Marketing clients, we are always able to generate much larger lists of commonalities than they expect for the people they want deeper relationships with. If you take some time with your own relationships, I’m sure you can do the same thing and push your relationship-building efforts into another gear!